Analysts have identified trends shaping the future of consumer financial products, including products offered by credit unions. The consensus is: consumers expect financial transactions of the future to be digital, not paper based. Excellent service is what draws—and keeps—credit union members. 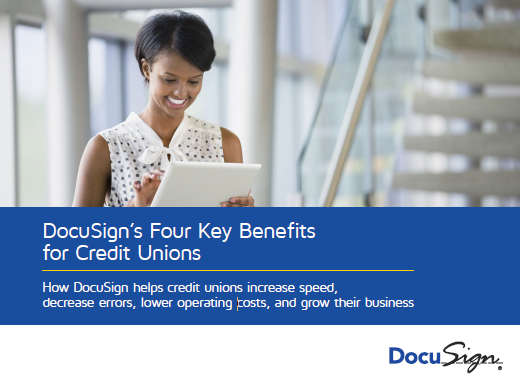 Read the e-book to learn how DocuSign helps credit unions increase speed, decrease errors, lower operating costs, and grow their business. By donwloading this e-book you agree to share your details with DocuSign.